We are delighted to be able to offer our collection of flower bouquets. Our collection is designed by our expert florists and designed to stunning, fragrant and suitable for all occasions. Aberdeen Flowers can be delivered the Same Day if ordered before 3pm and your flowers will be delivered in Aberdeen 6 days a week. As well as the Aberdeen area, our Aberdeen Florists can have your bouquets deliver all over the United Kingdom and in over 140 other countries where one of the florists in our trusted worldwide network will be sure to treat your order with the care it deserves. Whatever the time of year our team of expert florists in Aberdeen have designed suitable arrangements which will be a beautiful gift for all. We have specifially designed gifts for the seasonal months, winter, spring, summer and autumn. Our Aberdeen florists have also designed gifts suitable for specific occasions. Aberdeen Flowers is the place to order your gift, if you are unsure exactly what to send then please speak to one of our florists who will be delighted to help. If there are specifications you would like to make to ensure that your bouquet is exactly how you imagined, just share your vision with one of our skilled Aberdeen Florists who will be delighted to create your arrangement exactly as you desire. At Aberdeen Flowers we have a very wide selection of beautiful fresh flowers that includes many different varieties and colours of flowers so there is sure to be something to suit your recipient’s tastes. Our Aberdeen Florists can provide bouquets for any occasion, from birthdays and anniversaries to get well soon and congratulations. Just let us know exactly how you would like your Aberdeen Flowers to look and we can arrange this thanks to our bespoke service. On the other hand if you are not so sure about what flowers you would like, you can either choose from our extensive selection of designed bouquets or you can leave the decisions for colours and varieties up to one of our skilled Aberdeen Florists who will be sure to think of something beautiful to brighten up your recipient’s day. Our Aberdeen Florists love providing flowers for all occasions because we love the thrill people get from the wonderful gifts you can send with our Aberdeen Flowers service. If you let us know your recipient’s address we will make sure to bring your Aberdeen Flowers right to their door so that you experience no hassle when giving one of our lovely bouquets. 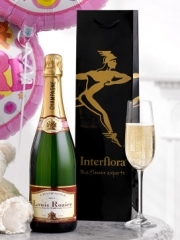 As well as flowers, Aberdeen Florists can have gift items sent to your recipient, including champagnes, wines, chocolates and balloons, which we can deliver along with your flower arrangements or even on their own. Our Aberdeen Flowers drivers will ensure that everything you order is delivered in great condition for your recipient to enjoy. Every one of our Aberdeen Florists loves the satisfaction that comes from providing a great customer service so we work hard to ensure that you will be delighted with everything you order here at Aberdeen Flowers. Whatever your needs for flowers, Aberdeen Florists will strive to offer you something to meet them so that you trust us with these most personal of gifts. For any further information or to place an order, contact Aberdeen Flowers online, over the phone or in our shop, and one of our Aberdeen Florists will be ecstatic to help with your enquiry. There is no greater pleasure for our Aberdeen Florists than helping customers, so whatever you wish to order or enquire, please do not hesitate to contact us here at Aberdeen Flowers.